We have just come out of a few weeks of sickness….a bowl of nourishing soup cooked with the bones in is perfect for healing! In a large pot, brown chicken drumsticks over med-high heat with butter for a few minutes. Add in garlic and continue to cook till aromatic. Pour in water and ACV and bring to the boil, then reduce to a low simmer. Add in rice, corn and celery. Allow to cook over very low heat with the lid on for an hour or two. The meat will be falling off the bone when it’s ready, and obviously the longer you can leave it the better. If you plan to cook for more than a few hours, hold off on the veggies until the last hour or so to prevent them turning to mush. 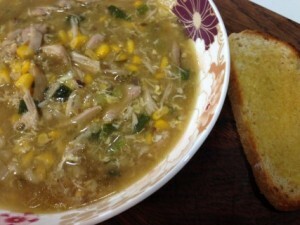 Remove chicken drumsticks from pot, shredding the meat and returning to the soup. Add in soy sauce and spring onions, stirring well. While still on a low simmer, drizzle in egg allowing the ribbons to cook for a couple of minutes. If you would like it slightly thicker, add 1Tbsp arrowroot and a splash of water mixed together to the soup while simmering.